If you live in a region with hard water, then you probably already know the struggle of keeping your hair healthy. Hard water really has some nasty effects on your hair, if you are not careful about the products that you use. The good news is that there are some great hard water shampoos and conditioners that really help to protect your hair and lock in the moisture so that your hair does not dry out and become brittle. 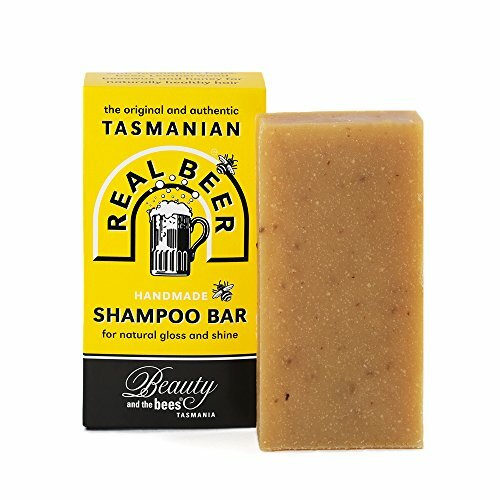 For those of you looking to use a bar instead of liquid shampoo, we took a look at some of the best hard water shampoo bars on the market, and have come up with a short list of our favorites like this 100% Natural Real Beer Shampoo Bar from Tasmania. While this one did make the top of our list, check out another product below that’s actually our top pick but it’s not even marketed as a shampoo bar! Shampoo bars are really becoming extremely popular, especially in areas that have hard water. Apart from the fact that they eliminate the need for plastic bottles and have a low carbon footprint, they are also great for traveling since there is no mess and no hassles with TSA (only 3.4 oz allowed). Shampoo bars are also multi-purpose (you can use them as a general soap and wash your hair also. It’s actually the way a lot of people just a generation or two ago got clean- they had natural soap bars that they used for hair and skin and often made them at home with all natural ingredients (my grandmother actually did this since she lived on a farm and make practically everything, including soap by hand). If you are new to shampoo bars, then you may not really know what to look for. Here are a few things that you will want to consider. First, consider the ingredients. When it comes to shampoos, many ingredients can actually dry your hair out. Natural ingredients are usually best, and it is a good idea to steer clear of sulfates. Sulfates actually strip your hair of natural moisture and shine. Another important ingredient to look for in your shampoo bar is nourishing butter, such as cocoa butter or shea butter. These actually help to replenish the moisture within your hair, making it healthier and shinier, and less likely to be dry or brittle. It is also a good idea to consider the fragrance of the shampoo bar. Many shampoos have added artificial fragrances, which can really be pretty damaging to your hair. Look for shampoo bars that have a natural scent, or those that are completely unscented for the best results. First on our list is the Dr. Bronner’s Pure Castile Bar Soap. It comes in a three pack, and is made up of a variety of organic oils, and has no added fragrance whatsoever. If you have sensitive skin or are sensitive to fragrance, it may be a great choice. I absolutely love Dr. Bronner’s and I never say that about household items like soap or shampoo! I got to know this brand while growing up in northern MN. Camping was a big part of life and these bars were a staple in our backpack-we took them along on camping trips because it’s biodegradable- and so useful. It also works well with hard water- we were using it with pure, unfiltered lake water- which has iron and other minerals and is very high on the hardness scale. Apart from shampooing your hair with it, you can hand wash clothes with it, lather it up for shaving, wash your dog…seriously just about anything. Of course, we also used it as a hand soap but it’s really the most versatile soap I’ve used with the added benefit of being natural and eco-friendly. This one pictured here is unscented but they have several fragrances available also- my favorites are almond and peppermint (although this may be overpowering for a lot of people- it’s strong and makes my scalp tingle (similar feeling as Neutrogena T-Gel without the medicinal smell) but I like the intensity and minty smell. 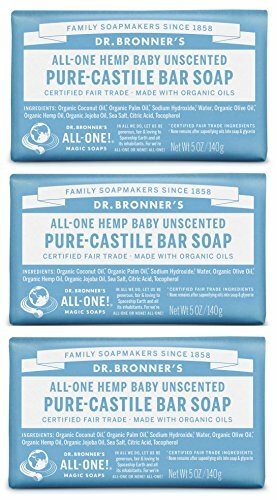 Dr. Bronner’s also sells a variety pack of 6 bars (one of each) if you wanted to try them all out to find your favorite. They don’t really market it as a “shampoo bar” but it definitely works for hair … and many other uses. Apart from that, it’s just a great company with a long (150 years) history and interesting story plus they give a lot back to the community. -or just buy directly from them on their website (we are not an affiliate of Dr. Bronner’s -but just love their products and recommend trying them out). This formula is great for people with sensitive skin and is also safe for babies and infants. It is fragrance-free and is made up of an olive oil blend that is naturally tear-free. No more tears with this shampoo bar! The ingredients are both organic and vegan-friendly, making it a great option for those who live a vegan lifestyle. The bar offers a rich lather, unlike some of the other shampoo bars that you see on the market. This is thanks to its emollient properties. Cost: This isn’t cheap stuff. If you’re looking for inexpensive bars of soap or shampoo this is not the choice ( I personally think it’s worth the cost (and it does go a long way compared to softer, cheaper bars). Some consumers have reported not being a fan of the scent. Although it is unscented, it does have the remnant smell of old fashioned, homemade soap. I can see why some people might not like it (especially if they first tried one of the brand’s stronger scents – like peppermint). The emollient properties tend to leave behind a moisturizing residue that can help add volume and shine to thin hair but may be too much for thicker hair. Click here to find out more of the history behind Castile soap. Hard Water Tips: If you are dealing with hard water, you may want to consider installing a water softening shower filter which can help alleviate much the problem (and is less expensive than getting a complete home water softener system), there are also some good body washes that work well with hard water if you wanted to pair those with your new shampoo bar. Next up, we have the 100% Natural Real Beer Shampoo Bar. This bar comes from Tasmania, Australia and allows your hair’s natural gloss to shine through. The company is also eco-friendly, and they don’t use any harmful plastics in the making of their shampoo bar. They also do not test their products on animals. This shampoo bar is actually very concentrated, so a little bit goes a long way. You will find that one bar will last you quite some time, saving some money in the long run. The company strives to ensure that all of their products are made in a cruelty-free, plastic-free environment, and they also keep their products free of sulfates, parabens and silicones – all of which can be damaging to hair. It actually smells pretty amazing, with a soft ginger cinnamon scent. After washing, it can leave your hair feeling quite dry or brittle until it is completely dry. It may seem like it hasn’t moisturized your hair, but give it time and you will see the results. If you have long, thick hair, it may prove to be a little difficult to get all of the soap out of your hair. This is just because it lathers so richly. 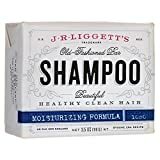 Finally, you may consider the J.R. Liggett Bar Shampoo Moisturizing Hair Formula. While it does not really lather up too much, this does not mean that it doesn’t get your hair squeaky clean. It is free of sulfates and is made up of an old fashioned formula that is free of detergents and has proven itself to be tried and true. This bar is packed with great ingredients, such as aloe vera, vitamin E and almond oil. These help to restore your hair to its healthy shine. Unlike some of the other shampoo bars you will find, this one tends to be pretty easy to rinse out. If you have thick or curly hair, you will need to follow up with a conditioner to get the best results from this shampoo. It can tend to make it tangly if you don’t. This bar is a lot smaller than many of the other bars out there, meaning it may not last as long. When it comes down to the bottom line, it is easy to see that there are a wide variety of different shampoo bars that are safe for use with hard water. While these are just a few of our favorites, you are bound to find others out there that are worth mentioning as well. Consider the 100% Natural Real Beer Shampoo Bar, which is all natural and free of sulfates, and also has no added artificial fragrances or dyes.